AMID global uncertainty and the UK’s most peculiar political and economic shambles, it was heartening this week to hear from inward investment agency Scottish Development International about its clear focus on attracting research and development and technology-based projects. It was also encouraging, particularly given recent weak UK growth figures and the dampening impact of the oil sector downturn on Scottish economic output, that the latest figures show SDI’s efforts bore fruit in the year to March. The rapid pace of technological advance has become very much a part of everyday conversation, with growing awareness of everything from the advent of driverless vehicles to the use of genomics and “big data” in the development of personalised medicine. There also seems little doubt that the pace of change is accelerating dramatically. And it is crucial for Scotland, for the prosperity of all of its citizens, that it ensures it is at the forefront of technological change. In this context, SDI’s breakdown of the sectors from which most of the inward investment in Scotland is coming made particularly encouraging reading. Technology and advanced engineering, oil and gas, and financial and business services were the biggest contributors of inward investment in Scotland, from the rest of the UK and overseas, in the year to March. Obviously, the technology focus applies across a raft of sectors and skill-sets, from life sciences to software to oil and gas. Taxpayer-backed SDI revealed this week that its “promotion of Scotland as a place to do business” had secured 7,839 jobs in the year to March from projects brought by companies from the rest of the UK and overseas. This was up 10 per cent on the previous 12 months. SDI flagged a surge in the number of such inward investment projects attracted in the year to March, to 139. In the previous 12 months, 96 such projects were secured. And, of the projects attracted in the 2016/17 financial year, 31 were classed as research, design and development. That is a good proportion. SDI operations director Neil Francis rhymed off myriad areas in which Scotland has the skills to compete on the global stage. He flagged opportunities for expertise in Scotland’s subsea sector to be applied in fields other than oil and gas, citing renewable energy and mining for minerals as two key examples. Mr Francis also observed that the expertise built up by Edinburgh in the technology sector in the last decade was gaining traction internationally. He flagged opportunities for Scotland in the growing “big data” arena. And he cited the potential for Scotland to host technology operations for big global players in the financial and business services sector. He highlighted US investment bank JP Morgan’s established software development operation in Glasgow as a good example of the type of project Scotland could win from this sector. The message from Mr Francis was all about focusing on areas in which Scotland could compete on the global stage in terms of the skills of its workforce and its often associated academic prowess in key sectors. SDI’s focus is demonstrated well by the list of companies attracted to invest in Scotland in the year to March. These included Singapore-based clinical service and research organisation Clinnovate, Chinese mobile games giant Skymoons, US marketing and sales solution provider Televerde, San Diego-based diabetes management expert Dexcom, and Chinese power company Red Rock. SDI published the latest annual inward investment figures on Monday, as Australian financial services company Computershare announced it had secured £2 million of funding from Scottish Enterprise to create 300 jobs at a new technology centre of excellence in Edinburgh. This is another good win for Scotland. It was encouraging, but not surprising, to hear SDI declare it had seen no sign of the heightened debate on Scottish independence, following the Brexit vote, affecting inward investment. The currently popular red herring about the constitutional debate affecting investment was also thrown about a lot by some, also without apparent justification, ahead of the September 2014 independence referendum. The number of jobs secured by projects that SDI helped to attract from companies in England rose sharply in the 2016/17 financial year. SDI noted the US remained the biggest source of inward investment by job numbers in the year to March, at 2,688, followed by England, on 1,769, up from 1,444 in the prior 12 months, and Germany, on 561. Mr Francis noted the importance of inward investment, and research and development and other high-value projects to Scotland’s export and productivity performance. These are key areas of focus, in terms of boosting long-term economic prosperity. Right now and in coming years, strong export and productivity growth will be even more crucial given the threat to trade from Brexit. And we should not forget the need to try to drive pay higher amid rampant inflation triggered by sterling’s plunge after last June’s Brexit vote. This is also good to hear, although again not surprising. Scotland has much to offer across a wide range of technology-driven sectors, in terms of the expertise of its workforce, academic institutions and companies. Of course, there are challenges, and we should not underestimate the dangers to Scotland’s skills base, academic institutions and businesses if the Conservatives’ Brexit fiasco discourages key overseas talent from complementing the local workforce. However, the latest figures from SDI signal that what Scotland has to offer at the cutting edge of technology across a raft of sectors is increasingly appreciated on the global stage. This morning’s monthly data release included an updated set of data for renewable energy generation in the first three months of 2017. This showed that combined UK renewables output stood at 24.8TWh for the quarter, a 5% increase on the 23.6TWh recorded in Q1 2016. While onshore wind was the principal contributor to this new record, providing 7.7TWh, UK solar also recorded a substantial year-on-year increase. Solar generation increased 16% on last year’s figure, reaching 1.7TWh for the quarter. This enhanced generation, BEIS said, was attributable to newly installed capacity. The first three months of the year saw a flurry of activity in the sector as solar developers rushed to meet the 1.2 ROC grace compliant deadline. Earlier this month Solar Media’s in-house market research team placed deployment in Q1 2017 at 640MW. BEIS’ own statistics, updated today, state deployment to be around the 303MW mark, however this figure will be revised upwards as the department’s figures catch up. Solar PV remains the UK’s most prolific source of renewable electricity by generation capacity, however its time at the top could be drawing to a close. The technology took the lead from onshore wind in Q4 2015 and has been the most-deployed renewable since then. BEIS now places total solar deployment at around 12.2GW, but actual deployment is likely to be in excess of 12.5GW, edging closer to the 13GW mark. Onshore wind has however continued to eat into solar PV’s lead. More than 700MW of capacity was deployed in Q1 2017 according to BEIS’ statistics today, taking its percentage share of UK renewables to 32% and, perhaps more importantly, to within 523MW of UK solar. With the Renewables Obligation scheme now closed to new installations, residential deployment under the feed-in tariff limited and subsidy-free schemes only just beginning to come through planning, onshore wind could retake the lead before the year is out. What is expected to be Europe’s largest community battery is set to be installed at an innovative regeneration scheme in Nottingham, with a 2MWh Tesla battery to be deployed in September as part of a housing scheme alongside community solar. The £100 million Trent Basin project is a new housing development built at the site of an inland dock previously derelict for around two decades. It is expected to deliver 500 homes over five phases with 375kW of rooftop and ground mounted solar and the Tesla battery to be installed by EvoEnergy. In an innovative use of the solar farm, planning permission has been granted on the basis that the site shall be cleared by 28 February 2020. By this time, the panels from the ground mounted installation will be removed and installed on new homes built as part of the development. With the addition of the battery storage facility and ground source heat pumps which will also be used on site, Trent Basin is intended to provide a new way to use renewable energy sources by generating, storing and distributing all at a neighbourhood level. A local energy company, Trent Basin ESCO, has already been set up to facilitate the local energy services. According to project lead Blueprint, the battery will store energy from the local renewable generation to be used on site while also performing grid arbitrage and smoothing out the peaks and troughs of supply and demand. “The way we generate and distribute energy in the UK is inefficient and carbon intensive. It doesn’t have to be like this. With new technologies, especially in renewable energy and storage it is possible to do better,” commented Blueprint’s chief executive Nick Ebbs. The pilot is intended to demonstrate how to lower cost and reduce carbon whilst allowing residents to better engage with the energy they consume. Residents that opt into the scheme will have photovoltaic panels installed on their roofs, and be provided with smart meters and voice controlled speakers for access to live data on energy created, stored and consumed. It is expected to provide energy savings of around 30% compared to conventional house developments and has already attracted several homeowners who have either bought or reserved properties. Trent Basin is being supported by £6 million of grant funding from two energy programmes run by Innovate UK, while a consortium has come together to deliver the scheme, including business, government and academia and led by public private partnership Blueprint. Newly anointed Siemens Gamesa has completed the installation of five 6-megawatt turbines on floating foundations in Stord, Norway, to be then towed to Scottish waters to be installed at what will then be the world’s largest floating offshore wind project, the 30 megawatt Hywind Scotland. Siemens Gamesa, the newly minted company arising out of the merger between the two company namesakes, which was finalized back in April, announced this week that it had completed the installation of five 6 megawatt (MW) wind turbines atop floating foundations. The completed turbines will now be towed to Scottish waters, where they will be installed 25 kilometers off the coast of Peterhead in Aberdeenshire, Scotland, at water depths between 90 and 120 meters, becoming the 30 MW Hywind Scotland floating offshore wind farm, the largest in the world. 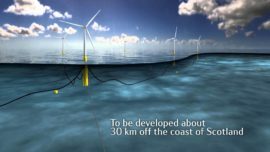 The Scottish Government approved Hywind Scotland back in November of 2015, at the same time that developer Statoil announced its final investment decision to build the project. Earlier this year, Abu Dhabi’s renewable energy company, Masdar, announced that it had acquired a 25% stake in the Hywind Scotland project. The Siemens Gamesa floating wind turbines are built onto ballast-stabilized foundations that will then be anchored to the seabed with mooring lines. Currently, the average traditional offshore wind farm is built in water depths between 20 and 30 meters (according to Fraunhofer IWES). While, strictly speaking, the further you get from shore the deeper the seabed gets, this is not always true, and developers have been able to move further from shore while finding water depths in the sweet spot. Nevertheless, this still restricts the consistency and strength of offshore winds, placing a natural cap on the efficiency of traditional offshore wind farms. However, floating offshore wind farms — as exampled by Hywind Scotland, which will be installed in waters between 90 and 120 meters — are able to go out further, without worrying as much about seabed depths (they still have to be moored to the seabed). This allows for lower installation costs, as there is no need to be building concrete foundations, and opens offshore wind farms up to more consistent and stronger winds. Check out our new 93-page EV report. Join us for an upcoming Cleantech Revolution Tour conference! The UK’s ambitious target of slashing carbon emissions by more than half within 13 years is at risk because of government dithering on energy policy, industry professionals have warned. A survey by the Energy Institute, the professional body for the energy sector, has found that four fifths of its members believe the UK is currently on track to miss the 2030 goal. “The mood among our members is that energy policy is on pause and ministers need to hit the play button,” said Louise Kingham, chief executive of the Energy Institute. Among the list of stalled government decisions are the fate of a multimillion-pound competition to build mini nuclear power plants and whether to strike a subsidy deal for a pioneering tidal lagoon at Swansea. A flagship plan on how to meet the UK’s 2030 target of cutting emissions by 57% compared to 1990 levels, originally expected last year, is now “long overdue,” Kingham added. The departure of energy minister Nick Hurd is seen as a blow to the plan, designed to set out how the government will tackle the huge shortfall in carbon cuts identified by its advisers. The group’s annual Energy Barometer report said Brexit was a new and “material concern” for further uncertainty. However, perception of risks from energy policy was slightly reduced from last year, when industry was suffering the fallout from the flurry of changes after the Conservatives took power in 2015, cutting renewables, carbon capture and energy efficiency programmes. The government’s decision to quit an EU nuclear cooperation treaty, Euratom, was seen as overwhelmingly negative for new nuclear projects including Hinkley Point C in Somerset. Nearly four fifths of Energy Institute members thought it would also negatively impact the UK supply chain. Post Brexit, the professionals largely want to keep EU energy and climate laws, such as the energy efficiency and renewable energy directives, the survey found. However, more wanted to scrap or abandon state aid rules than retain them. The group’s members oppose an energy price cap which many thought would hurt investment. But they favoured stronger action on energy efficiency – such as better building standards – as the best way to meet carbon targets and restore trust in the industry. The institute’s leaders also highlighted the need to begin decarbonising heat for homes and business. They said the government had been slow to look at alternatives to natural gas, because alternatives such as hydrogen or electrification were seen as harder than ways for cutting emissions from power, such as windfarms. As a result, the group’s members thought the contribution from gas for heating would only decline modestly by 2030. “It’s this gap on things like energy efficiency and a heat policy – that’s the real thing that will hold back investment and grow the uncertainty,” said Skea. IN 1993 THE Norwegian Environment Minister called John Gummer, the UK Environment Secretary, a drittsekk – a s***bag – because of the massive impact on Scandinavian lakes and forest of acid rain caused by emissions from British power stations. Throughout the 1980s Britain had been known as “the Dirty Man of Europe” because of our widespread pollution of air, land and water. The European Union is far from perfect but it has been the source of almost all environmental legislation and standards in Scotland. The air we breathe, the water we drink, the products we buy and the food we eat are all cleaner and safer because of 40 years of EU rules. Collective EU targets on climate change, renewable energy and energy efficiency have pushed the UK further than we would otherwise have gone. And the European Courts have helped concentrate the minds of ministers on meeting environmental standards and protecting nature properly. Already we have seen chemicals giant Ineos using Brexit to argue to relax climate laws and senior Tories suggesting environmental and safety standard could be slashed “a very long way” to help set up trade deals. Fortunately, most things to do with the environment are controlled by the Scottish Parliament. So if the Government down south decides to have a bonfire of environmental protections because they can’t be bothered with clean air standards, don’t like road schemes being held up by protected species or think that factories should be allowed to pollute more, we can make our own choices in Scotland and keep intact the laws we already have. The Scottish Government has already said it will keep our current laws aligned with European laws at the moment of Brexit. Crucially though, there has been no commitment to keep up with European laws as they evolve after Brexit. No doubt we in environment groups will press for a commitment on this, but the main pressure to keep up may well come from the business lobby, who will want to make sure they can continue to sell their products and services in the EU. There will be strong pressures to do away with some European protections from powerful sectors in Scotland. Farmers have been lobbying hard to use bee-killing neonicotinoid pesticides. The fishing industry has complained like mad about European fishing quotas, even though these limits are the only reason key species were not completely fished out in the last 20 years. In the Brexit negotiations the industry will be looking for a free-for-all deal that would see the rapid end of North Sea cod and decimate our marine environment. The UK will no longer be part of the EU’s joint climate targets but will still be a member of the UN, so the UK Government will need to come up with new climate targets as part of 2015’s Paris Agreement. They will no doubt try hard to do as little as possible, which is a problem for Scotland as we are supposed to be setting even tougher climate targets this year. When the UK is no longer bound by even the current weak renewable energy targets from Europe, the UK Government can pretty much give up entirely on renewables as it pursues the fantasy of fracking and nuclear power – entirely out of step with almost every other country in the world and to the great harm of a rapidly growing Scottish success story. There is plenty to fight for in the environmental dimensions of the Brexit process. Dr Richard Dixon is Director of Friends of the Earth Scotland. Renewables: How has Scotland progressed towards its ambitious 2020 targets? In January this year, the levels of pollution in London were higher than those in Beijing. The air quality index showed that particulate matter was concentrated at 197 microgrammes per cubic metre in London, while in the notoriously smog-ridden Chinese capital the reading was 190. The city’s mayor, Sadiq Khan issued the highest air pollution alert in London and said that the city’s "filthy air" was now a health crisis. The problem is not receding: Khan reacted in April by warning that diesel cars could be banned from Central London, after previously announcing a £10 toxicity charge for the oldest and most polluting cars in the city, to become effective in October 2017. And in March this year the World Meteorological Organisation (WMO) confirmed its finding that the average global temperature in 2016 was 1.1 degrees higher than pre-industrial levels, almost three quarters of the way to the target of 1.5 degrees set by the Paris Agreement on Climate Change at the end of 2016. It’s the kind of recurring news that recently saw the market value of Tesla overtake that of Ford after shares in the electric car maker and manufacturer of energy storage systems rose by more than 7 per cent. Events such as these demonstrate that renewable energy is not a fad but an imperative. In 2013 global renewable capacity in the power industry worldwide was 1560 Gigawatts, which was a year-on-year increase of more than 8 per cent and owing to increased efficiency, less investment bought more power. Back in the vast market of China, in 2013 more than $56 billion was invested in the country’s move toward clean energy – more than in the whole of Europe – while the renewable power capacity installed by the country in that year was bigger than its new fossil fuel and nuclear capacity combined. Meanwhile, technology in both storage capacity and generation are advancing fast, including the miracle material Graphene being developed to produce batteries that are suitable for high-capacity storage. Scotland has set itself ambitious targets, including meeting the equivalent of 100 per cent of Scotland’s electricity demand from renewables by 2020 – targets which it intends to extend and make even more challenging if it adopts the Draft Energy Etrategy it published for consultation earlier this year. The UK is confronting what has been referred to as the "energy trilemma" – the need to guarantee security of supply, keep costs low and decarbonise –and there is an urgent need for new storage technology that could help to balance the grid and enable more renewables to be deployed. Last month these were among the issues tackled at the 2017 Scottish Renewables Annual Conference where leaders in the industry debated the Draft Energy Strategy and plans for further carbon reduction. Keith Patterson, Co-Head of the Renewable Energy Group at corporate law firm Brodies, left the conference encouraged by the progress made but emphasises that there are areas, especially routes to market, that need to be addressed. "Scotland’s Draft Energy Strategy that came out earlier this year at about the same time as the draft carbon budget; one runs to 2030 and the other to 2032," he says. "The first thing to acknowledge is that Scotland has already come quite far and we already generate quite a significant proportion of our power through renewable energy while our carbon emissions have fallen by almost 50 per cent from 1990 levels. "So we have made progress – though perhaps we have done the easy part because what comes up next – according to the Draft Energy Strategy – is to tackle space heating and transport, and for the power sector to become fully decarbonised and a net exporter of electricity to offset lack of decarbonisation in other sectors, such as industrials. If we force industrials to decarbonise too quickly, we will simply cause it to shut down in Scotland and open up in other countries where energy is cheaper." He adds: "In terms of power, the changes in UK policy mean that there is no route to market for the so-called ‘established technologies’ such as onshore wind or solar, which is likely to cause a hiatus or at least a slowdown in their deployment. And the structure of the CfD (Contract for Difference) auction means that the ‘less established’ technologies such as tidal power are lumped together in one group alongside offshore wind. For these technologies there is no commercial pathway to deployment because they can’t compete with offshore wind, which will likely win virtually all of the CfD contracts on offer." He cites the example of Atlantis Resources, whose flagship MeyGen tidal energy scheme is in the Pentland Firth. "Given that it would have to compete for a CfD against offshore wind, Atlantis Resources opted to source EU funding to finance the next phase of its development. Of course, EU funding won’t be available for much longer and it’s unclear how less established technologies will be able to make progress towards large scale deployment in the future. The team at Brodies works across all the technologies, from obtaining planning consents, getting land rights in place to construction, finance and operations and also the buying and selling of projects. "It’s important not to be totally focused on one or another as things are constantly in a state of change and we have to be able to re-adjust what we’re doing in the light of new policies," says Patterson. The most interesting aspect of the Draft Energy Strategy, he says, is the ambition to decarbonise space heating. "It’s on a fast track in Scotland: the aim is for 80 per cent of domestic and 94 per cent of commercial buildings to have their space heating decarbonised – a huge reduction on the current position – in just 15 years. "The UK Climate Change Committee believes the UK 2050 target requires nearly all space heating to be decarbonised, if it is to be met. It appears Scotland will try to accomplish the same level of decarbonisation, almost 20 years earlier, by 2032." As energy regulation is not a power devolved to Scotland, the industry here is subject to decisions taken in London – and the EU, which introduces another note of uncertainty. "Brexit will affect the sector," Patterson explains. "It’s long been an ambition of the EU to create a single market in the energy sector but it is not there yet. The UK has been one of the architects of this ambition, but the Article 50 letter makes clear the UK will not remain a member of the EU energy market. The UK’s aim will be to agree a cooperation agreements but there will be unintended consequences in an area as complex as the energy sector." The UK Government, he adds, is keen to continue to build interconnectors and import power to balance the system and this has been a stated policy for a long time. "Britain was one of the leaders in the process so it should be relatively easy to comply at least for now; the questions will arise in a couple of years when policies diverge. But it seems clear that the UK will seek a cooperation agreement with the EU in the energy sector. "Scotland can import and export a lot of electricity, we have the wires that enable us to balance the system by importing power from England. So Scotland doesn’t necessarily need to replace all the baseload capacity it has lost, and will lose, between now and 2030. We will, he says, need local grid stabilisation services over the next few years – and more projects will seek to match demand, rather than supply always responding to demand, so there will be a range of developments that will create opportunity in the sector. However, Patterson emphasises that even for industry specialists and professionals, the future of renewables is far from being a known quantity. The Draft Energy Strategy, he says, does not paint a full picture of what the situation will look like in the future. "It talks about more onshore wind, decarbonising heat, and new gas and hydro pump storage … but we just don’t know what technologies will be used to store energy in the future. There isn’t anything yet that will meet demands at a Great Britain level and in many ways it’s a guess what our energy supply will look like in 2030." In the U.K., Ofgem has announced it will reduce a specific payment to some small electricity generators receive for producing electricity at peak times. Embedded generators with less than 100 MW capacity, including small-scale biomass generators, are among those impacted. Ofgem explained that embedded generators are power plants connected to lower voltage distribution networks. Smaller embedded generators with capacities less than 100 MW can receive specific payment from suppliers for helping them to reduce their charges to the transmission network. According to Ofgem, these payments are in addition to the price these generators get for selling their electricity. The current level of this payment is approximately £47 per kW ($59.62 per kW). That level of payment was forecast to increase over the next four years, reaching £70 per kW. However, Ofgem said it has decided to accept an industry proposal to phase in a reduction of the payment to between £3 and £7 per kW over the next three years, through 2021. The move aims to reduce customer costs. Ofgem estimates there is approximately 30 GW of embedded generation capacity on Britain’s electricity distribution networks. Those most impacted by the reduced payment levels will be those that can control when they produce electricity, including facilities fueled by diesel and small gas, combined-heat-and-power facilities, and biomass generators. Together, these producers are estimated to account for approximately one-third of embedded generation in the country. The U.K. Renewable Energy Association said the cut will damage existing products and the development of new clean tech projects. “This ruthless cut will be damaging to the development of next-generation flexibility and energy storage technologies,” said Nina Skorupska, chief executive at the RFA. “Additionally, several gigawatts of already installed renewable generation capacity will be negatively impacted. This comes on top of 18 months of damaging and sudden policy changes to the sector which are not only hammering the financial viability of new low-carbon projects, but now the viability of existing ones now too. “This move will clearly benefit larger, incumbent companies compared to the innovative renewable energy players that have burst onto the market in the past decade,” Skorupska continued. “This decision flies in the face of where the market is headed. Other nations are actively supporting the deployment of embedded renewable generation and further decentralization. They see this as leading to a grid that is cheaper, cleaner, and will strengthen jobs and consumers. University of Stirling expertise will contribute to a major inquiry into Scotland's energy future.Gavin Little, Professor of Environmental and Public Law at the University of Stirling, is a member of the Royal Society of Edinburgh's (RSE) newly launched Energy Inquiry Committee.The RSE's Energy Inquiry will contribute to the important debate around Scotland's energy supply, demand and use. It will also look to inform the policy and decision-making at a Scottish, UK and international level that will ultimately decide whether the path Scotland chooses to follow provides the resources needed at acceptable financial, moral, ethical and environmental costs.Professor Little's research addresses environmental and energy law and public law regulation; and developing new, interdisciplinary approaches to legal scholarship. A key theme in his work is integrating legal and regulatory analysis with politics, public administration, history and culture.The committee, which is expected to sit for around eighteen months, will consider how Scotland can meet future energy demand and how to ensure that the energy used is secure, affordable and environmentally justifiable.It will also examine all areas of the debate around Scotland's energy future in the context of its commitment to combat global climate change and the environmental imperative to reduce carbon emissions.Chair of the RSE's Energy Inquiry Committee, Sir Muir Russell KCB DL FRSE, said, 'The Royal Society of Edinburgh has decided to initiate this Inquiry, 'Scotland's Energy Future', at a time when Scotland's energy landscape is constantly changing. As the ways in which we heat our homes, fuel our cars, and power our places of work continue to evolve, important questions arise of what Scotland's energy needs will be in the coming decades, and how this demand is to be met. 'This Inquiry aims to contribute to the debate about Scotland's energy supply, demand and use, recognising our moral and environmental responsibilities. It is intended to provide a forum in which difficult and contentious issues can be debated, enabling a synthesis of objective advice to policy makers in Scotland and beyond. 'Professor Little of the University of Stirling, said: 'I am looking forward to serving on the Energy Inquiry Committee, which is taking place as renewable energy is gaining real momentum and we are now embarking on the challenging process of de-carbonising heating and transport. 'Much has been achieved in Scotland in recent years, and, looking to the future, it is important that we conduct a rigorous and objective analysis of our energy supply, demand and use, and the responsibilities we have as a nation for the energy we consume. 'More information on Scotland's Energy Future can be found on the Inquiry section of the RSE website or contact Professor Gavin Little email: [email protected]The University of Stirling published this content on 19 June 2017 and is solely responsible for the information contained herein. A pioneering green energy project that will see quieter, less polluting bin lorries on Scottish streets and provide eco-friendly power to local businesses has become operational. Levenmouth Community Energy Project (LCEP), based at Methill docks in Fife, is one of the first of its type in the world. It utilises renewable electricity produced locally by a wind turbine and solar panels to create hydrogen from water. Some of the hydrogen is then used to run a fleet of 17 low-emission refuse trucks and vans, while the rest is stored in fuel cells and can be called upon to generate low-carbon electricity when output from the renewables devices is poor. A ‘smart’ microgrid controls how much hydrogen gets stored and how much is converted into power to supply businesses. As well as commissioning two specially adapted dual-fuel bin lorries, the scheme aims to help local firms boost their environmental credentials by offering a range of hydrogen-powered vehicles for hire. LCEP is a partnership between locally based not-for-profit firm Bright Green Hydrogen, Fife Council and Japanese technology giant Toshiba. The scheme has received more than £4 million in support from the Scottish Government’s Local Energy Challenge Fund, plus funding from Transport Scotland to install an additional hydrogen storage and refuelling station at the council’s Bankhead vehicle depot in Glenrothes. The initiative has now reached a major milestone as the hi-tech control system is switched on. It means the site is now capable of operating automatically to balance hydrogen storage against renewable generation, and both the Methil and Bankhead refuelling stations are now up and running and capable of servicing vehicles. “It’s great news that this key stage in the project is now complete,” said George Archibald, chief executive of Bright Green Hydrogen. “The Levenmouth project demonstrates how we can use locally produced hydrogen to reduce both carbon dioxide and toxic emissions. Councillor Ken Caldwell, convener of Fife Council’s Levenmouth Area Committee, said: “This is great news for Levenmouth. “This innovative project will bring many benefits to the area. Stephen Stead, sales and business development director, at Toshiba, added: “The Levenmouth Community Energy Project has provided the perfect location to engage our technology with innovative green hydrogen applications. Two thirds of any profits generated from the scheme will go to a fund set up to tackle local fuel poverty.